In honor of me turning 30, I’m making mix CDs of my favorite songs from each of my 30 favorite musical artists/groups. Read the introductory post for more background information on my 30 at 30 project. Reminder: there is no scientific rationale for this list. They’re simply my personal favorites. Coming in at number 20 is Eminem. Marshall Mathers. Slim Shady. Eminem. Whatever you want to call him, he is certainly the most controversial inclusion on my countdown so far and arguably will be the most polarizing selection on the entire list. When I first heard Eminem I was 14 years old and in 8th grade. It was around that time that I convinced my parents to allow me to purchase CDs with the parental advisory: explicit lyrics sticker on them. Eminem’s lyrics earned that label and then some. However, I never adopted the foul-mouthed act that Eminem and most of my peers did. To this day, my curse words are few and far between. I think Eminem’s vulgar and obscene lyrics were part of his appeal to 14-year-old me. It was cool and it was different and it was edgy and it was taboo. Today, when I go back and re-listen to some of Eminem’s tracks, I cringe at some of the more aggressive lyrics and wonder why I ever bought that CD in the first place. But then I hear the next track and I’m immediately reminded of Eminem’s genius: his lyrical wordplay. Eminem is hardly the first flawed artist. Personally, I don’t think that detracts from his skill at the craft. Without the crassness, his craft probably wouldn’t be what it is anyway. I remember fondly taking creative writing classes at Mercyhurst and one of my best friends in the class, Mikey Rapone, listed Eminem as his favorite poet. The professor was somewhat skeptical of a rapper’s inclusion on the list, but I think the argument was and is valid. All questions of content aside, a study of Eminem’s mastery of language in his lyrical construction is something many other rappers and poets alike can only dream of. Years from now—if it’s not already being done—Eminem’s rhymes and sentence structure will be studied the way we study Poe or Whitman. The first four tracks on my compilation are among the radio friendliest. “My Name Is”, which is the only inclusion from his debut Slim Shady LP, “The Real Slim Shady” from The Marshall Mathers LP, “Without Me” from The Eminem Show and “Just Lose It” from Encore each served its purpose as a catchy rap-pop crossover hit. They’re crowd pleasers, lighter in terms of subject matter with more tongue-in-cheek humor. Track five comes from the 8 Mile soundtrack. 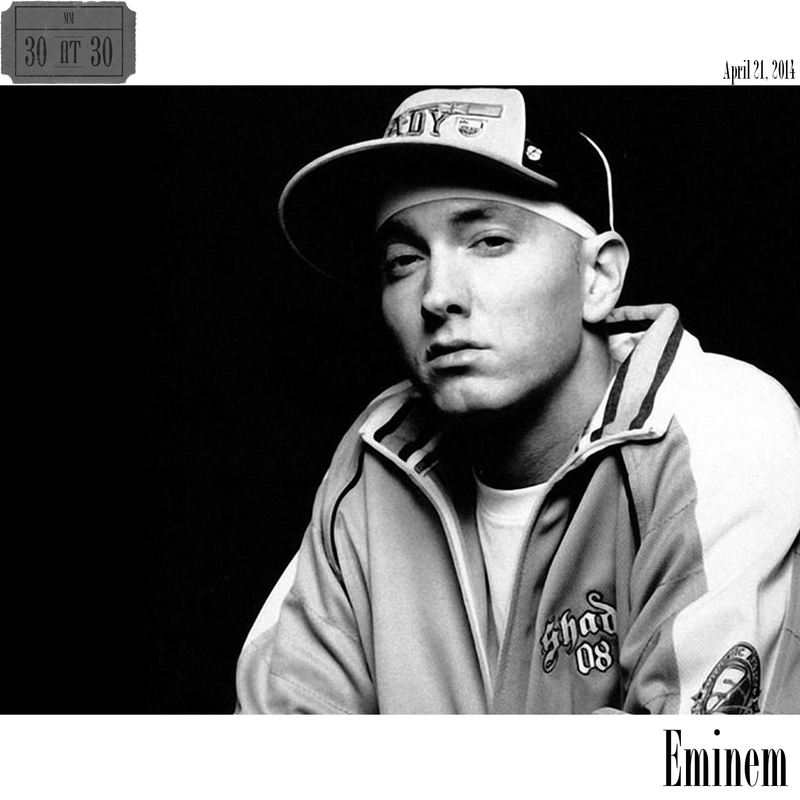 “Lose Yourself”, which in part describes the battle rap scene that Eminem grew up in, is among the many Eminem tracks on this compilation that double as excellent inclusions on a workout or pump-up pre-game mix. “The Way I Am” was a personal anthem of mine during my high school basketball days. One of the best showcases of Eminem’s talent comes on Drake’s 2009 song “Forever” from the More Than a Game soundtrack. Eminem bats cleanup after an all-star lineup of Drake, Lil Wayne, and Kanye West and delivers with the consensus best verse on the track. “Yellow Brick Road” is a great example of Eminem’s ability to tell a story through rap, filling in a lot of his personal backstory and entry into the rap game. On his most recent album, Eminem again put his storytelling on display with “Headlights”, which attempts to put to rest years of infighting between Eminem and his mother. I’m fortunate enough to have great relationships with all the most important women in my life—my wife, my mom, my sister, my grandma—so I can only imagine what it’s like. But listening through some of those aforementioned disturbing lyrics, it’s clear that Eminem has had more than his fair share of trouble with the important women in his life. One song doesn’t fix things, but the message here feels like an attempt at moving forward. Regardless of whether you prefer some of the earlier, darker stuff or, like me, gravitate more toward songs like “Headlights” or 2002’s “Hailee’s Song” (about his daughter), it’s hard to argue that when Eminem is at his best, he’s being real and honest. Even if you don’t always like what he says, it’s hard to argue that anyone could say it better than Eminem, a 21st-century wordsmith.